If there were awards given out for creative mobile slots titles then this effort from Las Vegas-based slots developer IGT of Sushi Yum-Yum - Extra Wasabi must come fairly close to winning the award for all time best. 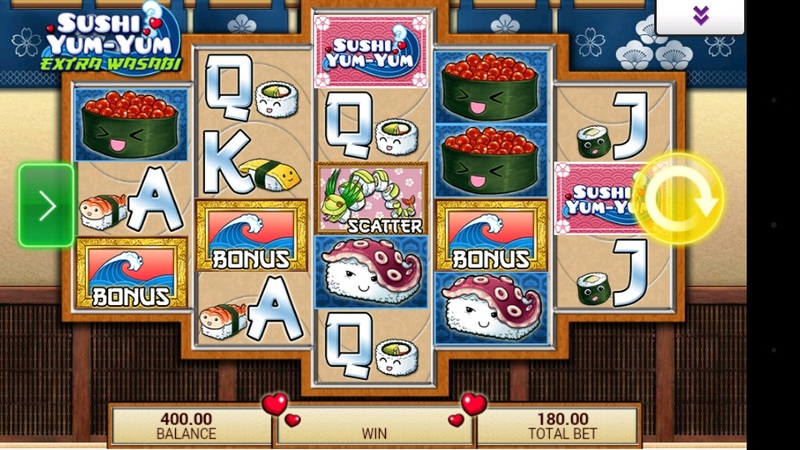 As the name suggests this slot is all about the popular Japanese food - sushi. 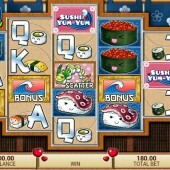 Sushi Yum-Yum - Extra Wasabi is a 5 reel, 720 ways to win mobile slot with the popular MultiWay Xtra feature. This mobile slot is slightly different for IGT because it did not receive an online release like a lot of other IGT slots. It also appears to copy the engine of the Siberian Storm mobile slot from the same developer. Lazy development or just maximising the potential of a good idea? You decide! The symbols across the reels consist of the Sushi Yum-Yum logo, a cat fanning itself, a couple of pieces of raw sushi with faces on them, and the regular Jack-through-to-Ace symbols that have various pieces of sushi attached to them. Watch Out for the Wasabi Wild! The Wild symbol is represented by the wasabi. Bizarrely, the wasabi also has a face. It appears on reels 2, 3, and 4 with the power to substitute for all other symbols, except for the Scatters, to complete any potential winning combinations. There is a Scatter symbol on the reels and this comes in the shape of the Scatter logo. If you hit three or more of these symbols across the reels you will trigger up to a 50x multiplier. Not a bad little pay out. If you're worried that the Scatters not triggering a free spins bonus round means there are no free spins then relax. The free spins bonus round can be triggered when the Bonus symbol, displayed by a crest of a wave in a picture frame, appears on all five reels on a single spin. This will reward you with 5 free spins. It's not a huge number of free spins but we take the free spins where we can get them. Especially with the Scatter payouts being so generous. It is also possible to re-trigger the free spins up to 150 free spins. Sushi Yum-Yum - Extra Wasabi ticks all the boxes for randomness and the absurd. However, it lacks slightly on the gameplay front. The inclusion of free spins and lucrative Scatter payouts is a nice change from the norm but the lack of additional bonus features leads to a shallow game that feels like something you might spend a maximum of 5 minutes playing on the train. No wonder they only launched it on the mobile platform. Stick to the IGT mobile classics such as the Egyptian-themed Cleopatra and the cat crazy Kitty Glitter.